Just like the MPMediaPickerController class in the preceding section, Apple has provided an ABPeoplePickerNavigationController and associated delegate protocol to allow you to both prompt the user for contact information and display contact information to the user. However, in this case the framework it provides also allows your application to interact with person and group records directly. To illustrate how to use the ABPeoplePickerNavigationController, we’re going to reuse the Prototype application code yet again. So, open the Finder and navigate to the location where you saved the Prototype project. Right-click on the folder containing the project files and select Duplicate; a folder called Prototype copy will be created containing a duplicate of the project. Rename the folder Prototype4, and just as we did before, prune the application down to the stub (as we did in the previous section for the media player example) with the Go! button and associated pushedGo: method that we’ll use to trigger the display of our address book picker. We’ve reached a point where you can compile and check the code, but remember that you should also add the AddressBook and AddressBookUI frameworks to the project before clicking the Build and Run button in the Xcode toolbar. When you do so, you should see the familiar gray screen with the Go! button as shown in Figure 1; click it and you’ll be presented with a view of the address book. 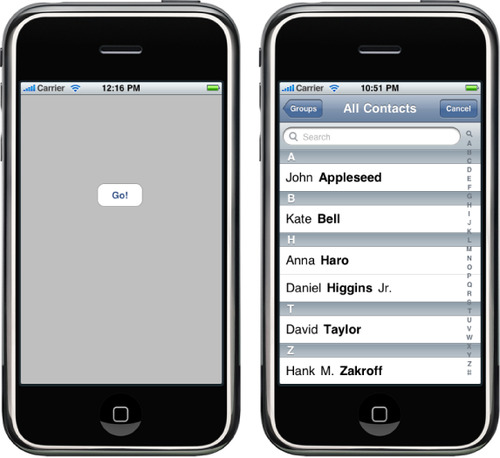 Selecting a name in the address book will dismiss the picker view and return you directly to the main gray screen. There are two basic types of properties: single-value and multivalue. Single-value properties contain data that can have only a single value, such as a person’s name. Multivalue properties contain data that can have multiple values, such as a person’s phone number. You can see from the preceding code that single-value and multivalue properties are handled slightly differently. You can find a full list of the different properties available in an address book record in the ABPerson class documentation. Make sure you’ve saved your changes and click the Build and Run button in the Xcode toolbar to compile and deploy your application into iPhone Simulator. When the application launches, click the Go! button and then select a name from the list. You should see something similar to Figure 2 logged to the Console (select Run→Console from the Xcode menu bar to display the Debugger Console). What if we want to retrieve a specific phone number from the list? It’s easier to let the user select the phone number he needs, and that’s where the peoplePickerNavigationController:shouldContinueAfterSelectingPerson:property:identifier: method would come into play (we returned NO from this earlier in this section, so this example does not allow the user to select a number). A multivalue property is a list of values, but each value also has a text label and an identifier associated with it. This second delegate method provides you with both the property and the identifier for the value (i.e., a specific phone number) that is of interest to the user. The preceding code will instantiate a copy of the address book, retrieve references to all of the records, and then iterate through the array of records. Then, in the same way we dealt with records after interactively retrieving them with the picker controller, we print the full name of each contact to the Debug Console.